Tiki has made a comeback. In the past several years, we’ve seen a slew of bars open paying homage to the original 1930s and 40s South Pacific-stylized joints Don the Beachcomber and Trader Vic’s. You can point to a number of reasons for the renaissance. For one, tiki is all about camp: its grass-thatched roofs, hollowed-out coconuts, fake palms and string lights are a foil to buttoned-up speakeasies (and urban life in general). Then there are the tiki cocktails like the Mai Tai and Pina Colada that can be so much more than the sugary mixer and rail booze many ocean-side establishments serve. Done right, they’re balanced and clean, allowing an under-appreciated spirit — rum — take the spotlight. “The idea of tiki is intoxicating,” say Julian Cox and Josh Goldman, the guys who create some of SoCal’s best bar programs. “It’s the promise of a never-ending tropical vacation in a glass. Most bartenders have the same dream of retiring to the Caribbean and sipping strong rum concoctions to the day we die of old age or shark attack.” If you share their views on life and death, or just want to get your friends a little unmoored right in your landlocked backyard, we’ve got your guide for an at-home tiki experience. Imported sand optional. The cornerstone tiki spirit is rum, which comes in three basic forms: light, golden and dark, determined by the length of time it’s aged, type of barrel it’s aged in and additives like caramel. Cox and Goldman recommend Denizen Merchant’s Reserve, which was created to approximate the type of rum Trader Vic’s used in its Mai Tai. Beyond that, your shopping list includes orgeat syrup, Sherry, falernum, absinthe, curaçao, and fresh citrus and tropical juices. If you’ve ever had a swizzle — the tall tiki drink that’s like an adult snow cone — you’ll notice the distinctive, almost pebble-like ice that fills the glass past the brim. “Ice is an ingredient,” Cox and Goldman say, and you need to treat it as such. Dilution is very important with tiki cocktails, so find the cleanest, purest ice you can (or DIY with the method perfected by our friend Camper English that requires a cooler and a saw). Invest in a hand-crank snow cone shaver, or use the traditional method of a Lewis bag — taking a mallet to a canvas bag filled with ice. The canvas bag dulls the edges of the ice, which means the ice will melt more evenly. 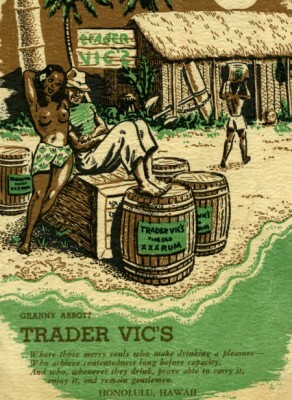 A vintage poster from Trader Vic’s, a tiki bar first founded in 1934. Make this basic Mai Tai to ensure you know what you’re doing. Repeat a few times for good measure. In a cocktail tin, shake together rum, juice, orgeat and curacao without ice. Pour into glass, add crushed ice and mix with a swizzle stick or bar spoon. Insert straw, add more crushed ice to the top and garnish with mint and dust with sugar. Bonus: Build an actual tiki bar. You can buy a bar for upwards of $3,000, but you can also build your own in an afternoon. We went to Alexander Bender of Tri-Lox, a sustainable design-build workshop in Brooklyn, for the basics.To make a two-person bar that’s 60″ long, 18″ deep and 42″ high, you’ll need plywood for the top, 4’x’4s for the legs, 2’x4’s for the walls, plus cladding. First, purchase a piece of plywood cut to 60″x 18″ to serve as the top. Using a Miter saw, cut 4-4’x4′ pieces of exterior-grade wood, such as Yellow Pine or Douglas Fir, to 41″ for the legs. Cut 6-2’x4′ pieces of the same type wood type to 10″, and 3-2’x4′ pieces at 52″. (Wear a particulate mask while sawing to avoid breathing in particles that contain chemicals from the treated wood). Using a power drill, screw and fasten together the legs and the studs. First attach the 3-2’x4’s that will be the top of the bar (your plywood will sit on this). Then attach another set of 3-2’x’4s that come up 6″ off the ground. Attach the last three between the two pieces already in place. Lay your plywood on top and drill to secure. Attach metal feet on the bottom to prevent water damage and cracking. To give your bar the tiki touch, you’ll need cladding. You can go with traditional bamboo, but Bender suggests trying a reclaimed wood to make it look authentic. “You want something that performs outside, so make sure it’s properly dried and a species that does well with moisture, such as Cedar or Yellow Pine.” Distress the wood to give it a worn-in look if needed (Bender suggests getting creative here — for instance, slamming chains against the wood to scuff it), screw it into the three sides of your bar, then treat the whole bar with three coats of an exterior-grade color and sealer (or decking finish), sanding between coats and at the end. Alternatively, you can substitute cladding with straw beach mats nailed to the three sides of the bar, but note that it will degrade. Add finishing touches like grass thatching and string lights.